All that is required to become a member is a confidential interview, the presentation of an ID card, and filling in a form. The classic way is to start with baptism, which traditionally means infant baptism. This is the base for reception into the Christian community and into the Evangelical Church. How to become a member – it is possible to do this in different ways according to one’s pattern of life. For those who have not been baptized in the past, membership is obtained through baptism. For some people this is the first time they have wished to become a member of the Evangelical Church. For some it may be that they were baptised as children but then stopped going to church before they were confirmed. For others it may be that they left the church later for a variety of different reasons. The Evangelical Church in the Rhineland makes (re-) entry a relatively uncomplicated matter. The easiest way is to contact the local pastor. In addition, there are a number of special reception points which specialise in ensuring that those interested can easily find competent people to talk to and can be received into membership as appropriate. 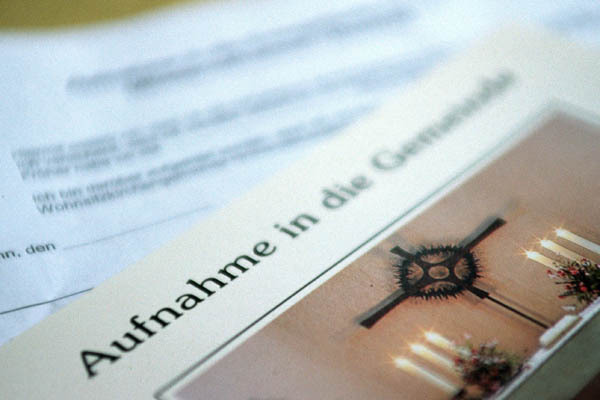 There are just two dozen reception points available in the Evangelical Church in the Rhineland. Some people don’t know their local minister. Others are fearful of having to go back and justify the reasons for having left in the past. The fact is that people who have psychological inhibitions about seeking to (re-)enter the church in their own local parish, have the alternative of going to one of the reception points. Basically, all that is required is a confidential interview, the presentation of an ID card, and filling in a form. If the minister feels it necessary, then a course of instruction in the Christian faith may need to happen before reception takes place. Reception into membership at one of the reception points is uncomplicated and unbureaucratic. In addition the person usually receives a small gift and a personal word of blessing.